Doesn’t it feel great to finally be in February?! I don’t know why January felt like the longest month ever! Maybe because our Christmas break was so long and didn’t end until way into January! But, February is always a fun and festive month because we celebrate Jordan’s birthday, Valentine’s Day, and my own birthday! Lots going on in that 3rd and 4th week! This weekend is a kiddo basketball game and how could I almost forget, The Superbowl!! We’re going to my friend Ali-Shaun’s house for a get together and don’t be surprised if she shows up again here soon! We’re planning a Style-A-Friend post for the near future!! Can’t wait to share that with you! Tomorrow (Saturday) morning, I’m doing a hair curling tutorial on Stories if you want to see the blog post come to life! The post gave the basics, but it’s always better to see things in action. 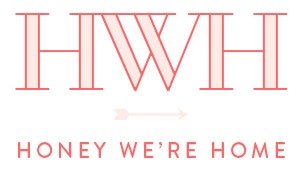 Also, if you want exclusive content, sneak peeks, and healthy recipes, subscribe to the HWH Weekend Edition. That arrives every Saturday morning to your inbox! So onto today’s dressing room post, that I’m all giddy for! 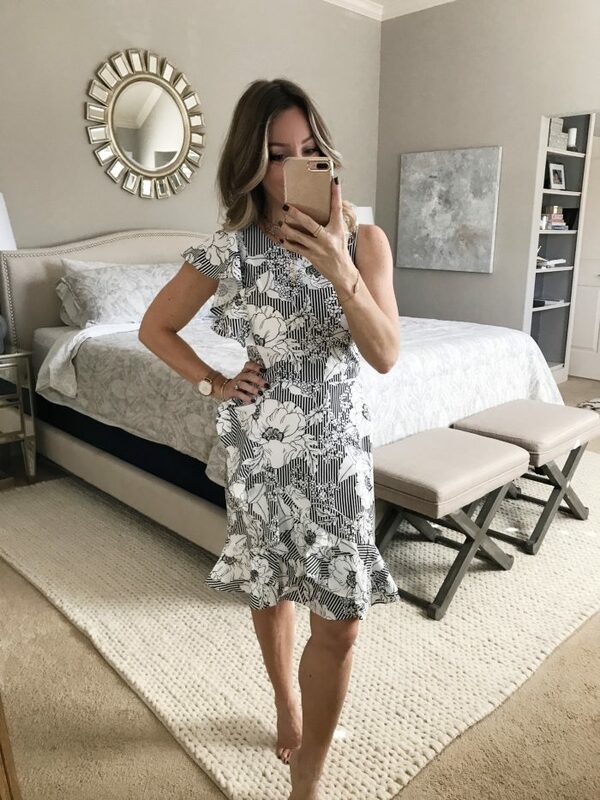 I found some great pieces that will work now and also carry you through the Spring! Which I know we’re all looking forward to, right?! For size reference, I’m super petite, 5’1, 105ish, 34D. I usually wear 0P or 25 in jeans and XS or XSP tops. First up, I found an Audrey Hepburn-chic pant that will flawlessly make the transition from work to weekend. I’m imagining all the possibilities with these pants from a tucked-in button up top and heels for a smart work look – to flats with a lightweight sweater or cardigan for looking pulled together while running errands on the weekend. It’s worth mentioning that these zip on the side, with a flat front and no pockets, which gives them a streamlined look. I thought Vince Camuto ran big so I sized down to a 00P and probably shouldn’t have. They don’t have much stretch and although they fit well through the legs, the waist was a too tight. So, I’d say order your true size in them! This cardigan is exactly the type of thing I liked to keep in my office for days it got chilly or if I had a surprise meeting and needed to look a little more polished. It’s that great, lightweight sweater material and it comes in lots of color options. I adore both the drop shoulder which gives it a more relaxed feel and the double front pockets. It would also look good over a button down for work or with jeans and a tank on the weekend. Those slim black pants also come in white and I definitely appreciate the no pockets showing through the material. Speaking of, the material of these pants has a nice weight to it – it’s not too thick and they’re machine washable (98% Cotton #praisehands). STYLE TIP: Because these pants are fitted and have no pockets I would absolutely suggest these no show undies or a barely there thong. 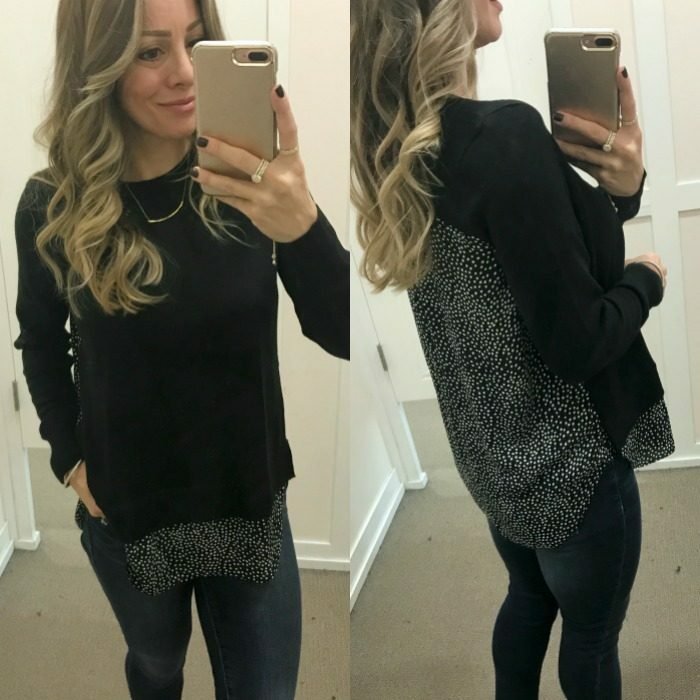 This faux wrap top would be great for a night out or even a casual weekend. It’s on the sheer side, but not see-through. I like how the tie on the side gives it some extra personality and you can wear it long or tied in a bow. The color combination is one of my faves! I couldn’t wait to try on this jumpsuit! Adelyn Rae is a brand I’ve had good luck with in dresses and jumpsuits in the past, but at first glance, out of the box, I was certain this would be SOOOOO long on me, and I was right. #boo! The XS fits well through the bust and waist – but the crotch and length is just too much. If you are taller PLEASE get this so I can live vicariously through you- and note that the shoulder straps are adjustable. 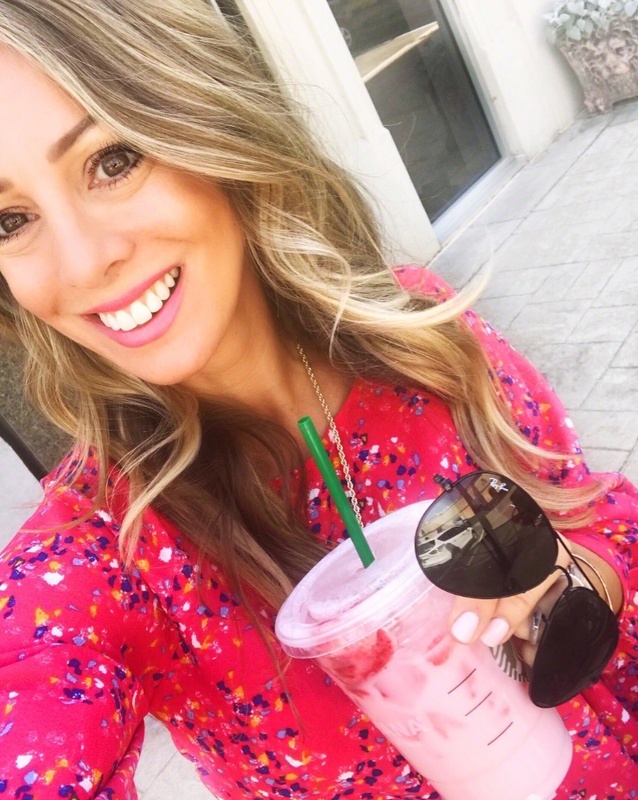 You will look super cute and get tons of compliments at a Spring event. The check pattern is a nice update to a plain black outfit. BONUS : It has pockets!! 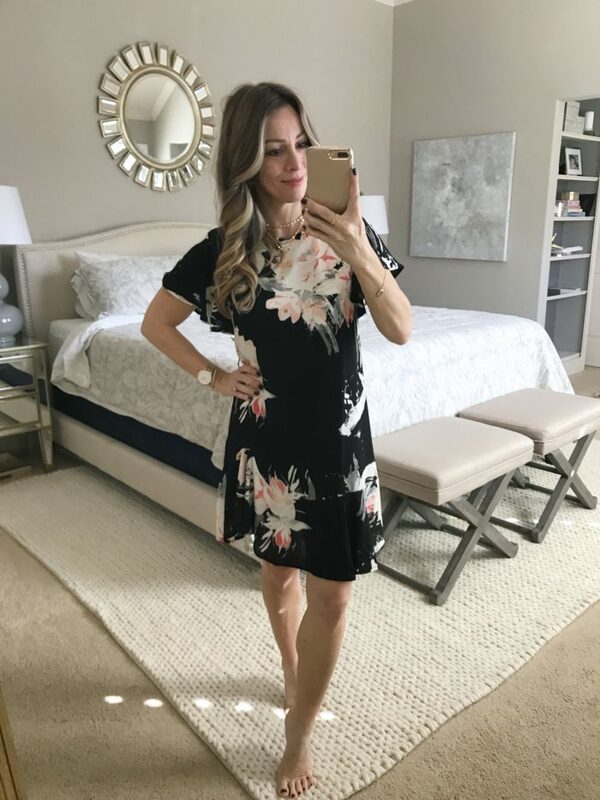 I had WAY better luck with this fun pattern dress – it comes in petite! It’s the perfect combination of sophisticated and feminine! I’m already planning what event I can wear this to next! #somebodyinvitemetosomethingplease I’m smitten with the asymmetrical silhouette and the one sleeve ruffle. I also felt like this is really figure-flattering, the way it makes you look all hourglass. And the black and white background gives you plenty of opportunity to add a pop of color with shoes, bag or jewelry. For an inexpensive, fun and flirty dress, you can’t go wrong with this $55 number. It has flirty flutter sleeves and a drop waist that’s especially convenient to wear out to your next big dinner. The XS is a bit roomy on me through the waist so for a perfect fit I would get the sides nipped in a bit. I like this floral pattern, but the plain pink is a really sweet blush color. This under $50 shirt dress could be a winner for work or weekend. It’s kind of hard to tell the true color, but it’s a soft pink/tan and a linen-y material. The cut is nice with a shirttail hem. Just add black heels and a bangle bracelet and you’re dressed for work! It fits TTS, which unfortunately, is too big on me and doesn’t come in XS. If you’re petite like me, this might be a little roomy. 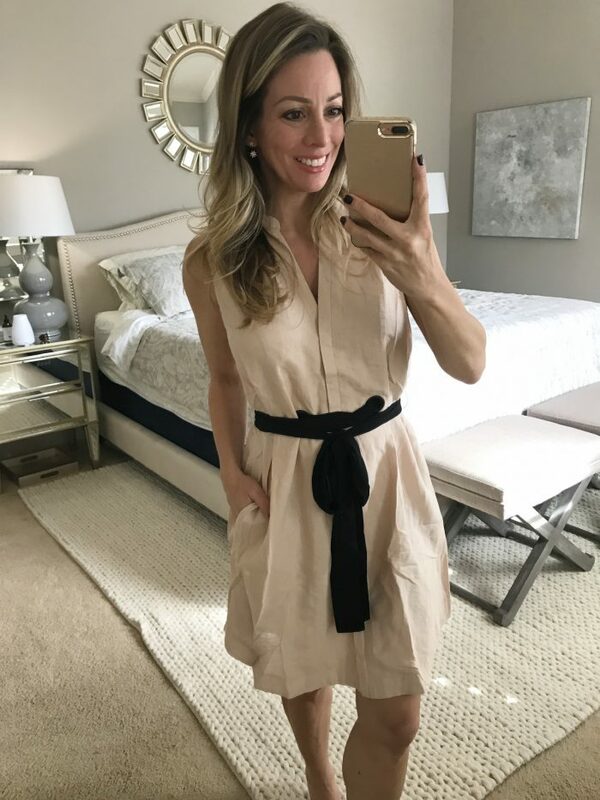 Would you believe this adorable denim dress is under $25?!! 🎊 It would be so cute with wedges and you can even add a belt! I’m wearing size regular XS and it fit fine, but it also comes in petite! For that in between time when it’s still winter, but you’re ready for Spring, this lightweight sweater is a good choice. It’s still a sweater, but the ivory pink and grey colors lend itself to Spring and the flared ruffle sleeves are a cute touch! This top looked boxy on the hanger, but I liked how it looked on. When you get tired of jeans and want to change it up, these skinny chinos will be your BFF! They are super soft and stretchy with a little front slit at the cuff. They also come in a pretty blue. I’ve been on the hunt for a great pair of work pants I can recommend and this pair of slacks come close. It’s the Julie fit at Loft that have a bit of linen and structured stretch that is known for smoothing you where you want it. The Julie pant is a curvier fit (smaller at the waist and rounder at the hips), which isn’t the best fit for my frame, but would work on women with better hips than I have. They come in regular, petite and tall, which means no alterations! And get this, you don’t have to dry clean them! I was crazy for the fit and feel of this Modern Skinny jean. They are mid-rise with a lot of stretch and were so comfortable. The faded denim is a nice casual wash that’s easy to pair with both light and dark colored tops. This is one of those pairs of jeans you could easily lounge around in and be completely comfortable! If you like a tee that covers more of your upper arm, this style would work well for you. The pink and white stripes are a change from the typical black and white combo we often see. Cute, right?! Get the layered look in just one top with this one! I was surprised at how much I liked it! I think this one in XS was too long on me, but with the right size (XSP for me), it would be great! Picture it with a statement necklace and it would be even better! 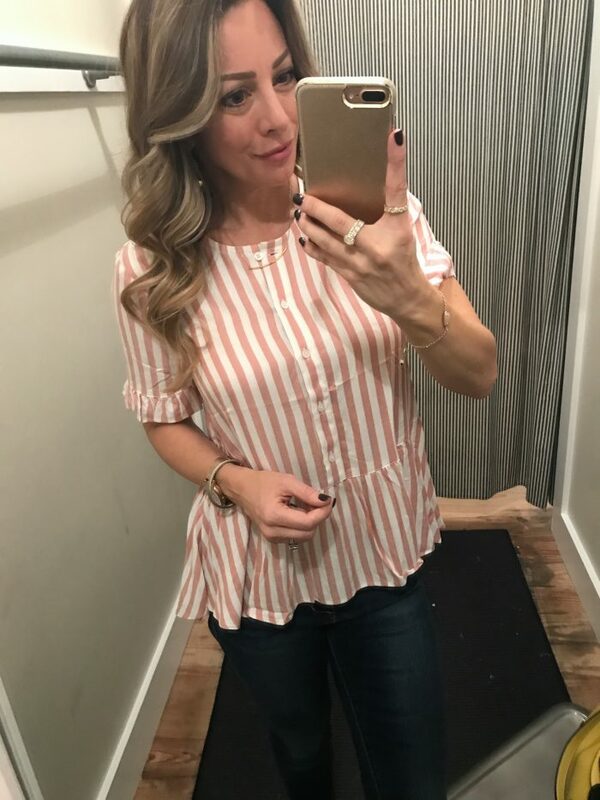 Okay, so this is striped top #6, but who’s counting?! 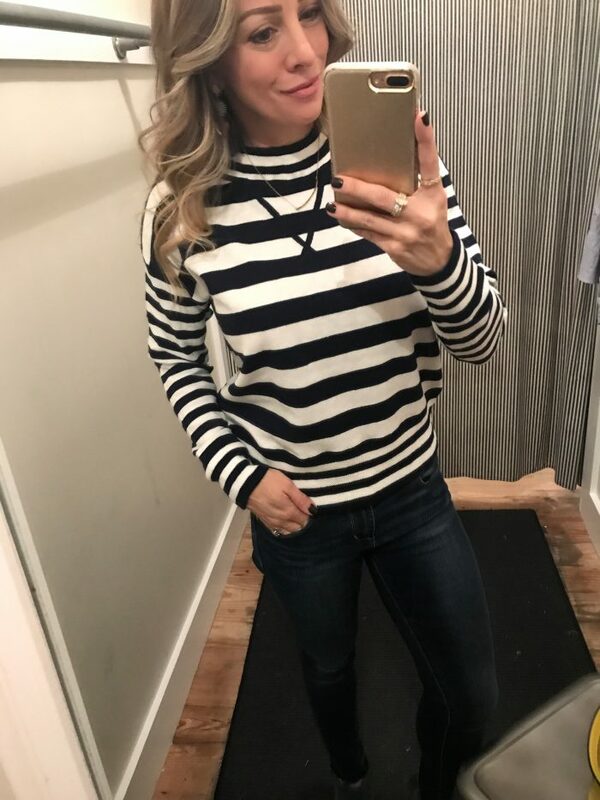 I like the contrasting size of the stripes and the banded waist on this top, but in retrospect, maybe the neck is a little high?? It just felt so good on though! This top and the one below are identical in style, just different color/pattern. More stripes below! 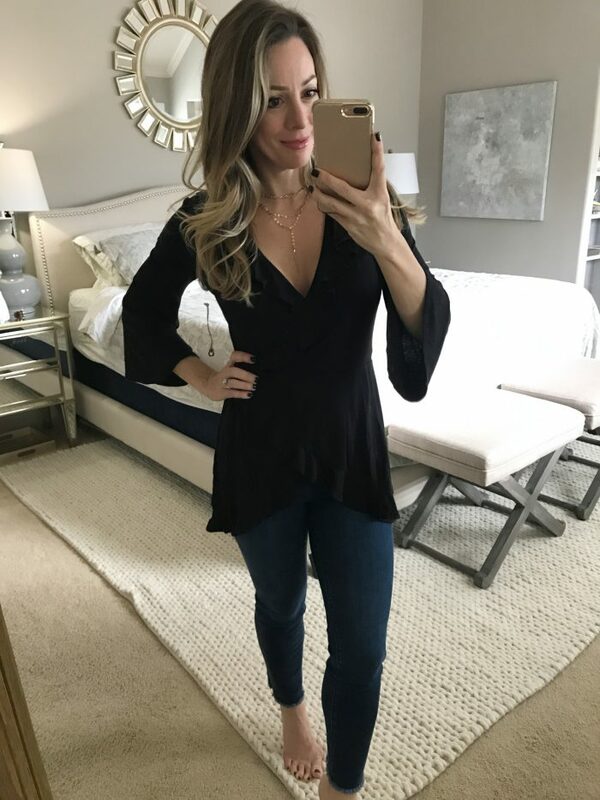 😉 It’s harder to see the fabulous details in the black one, but you can clearly see the darling ruffle on the sleeve and peplum hem in the bottom picture. 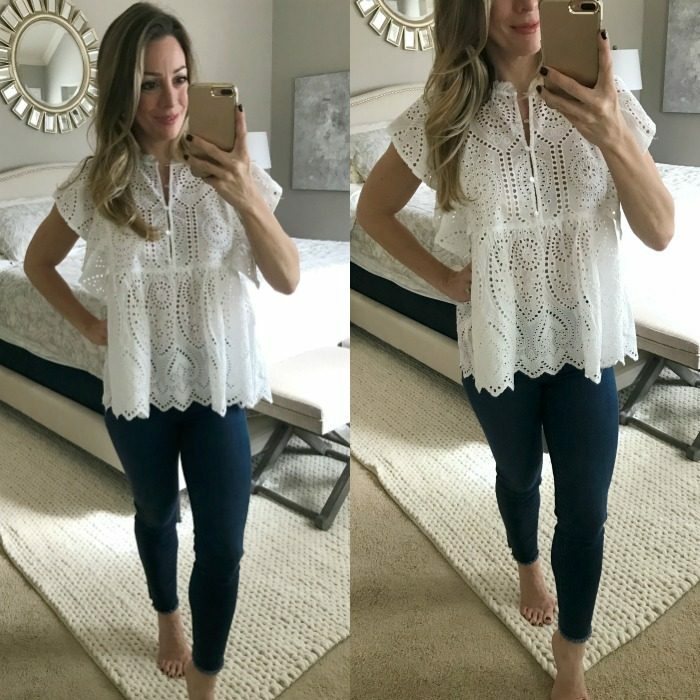 I like how this top is as easy to wear as a t-shirt, but looks much more put together with the buttons and style! I bought both!! It will be Spring before we know it and tanks like this are an easy addition to your wardrobe. Tanks and jean shorts are also my summer uniform because it gets so hot here! The LOVE sentiment is perfect for Valentine’s day! And the tank is only $10!! 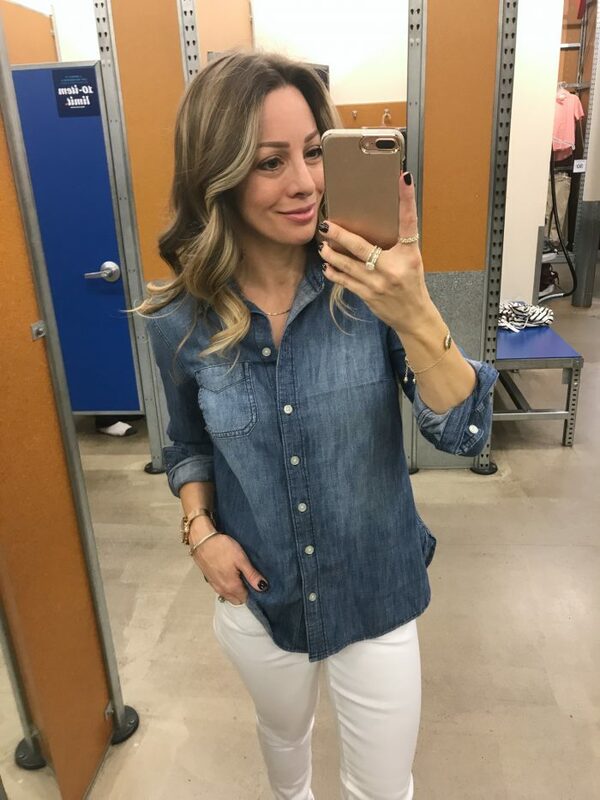 I’d go so far as to say we all need a chambray button-down shirt in our closets. They work wonderfully with white jeans in Spring and Summer and tucked into skirts and pants for the office and with jeans and jean shorts too. The trick to wearing denim on denim is to vary the hue so you don’t look all matchy-matchy. I also like to wear a chambray top open with a tee or tank underneath and even a longer one over swimsuits. 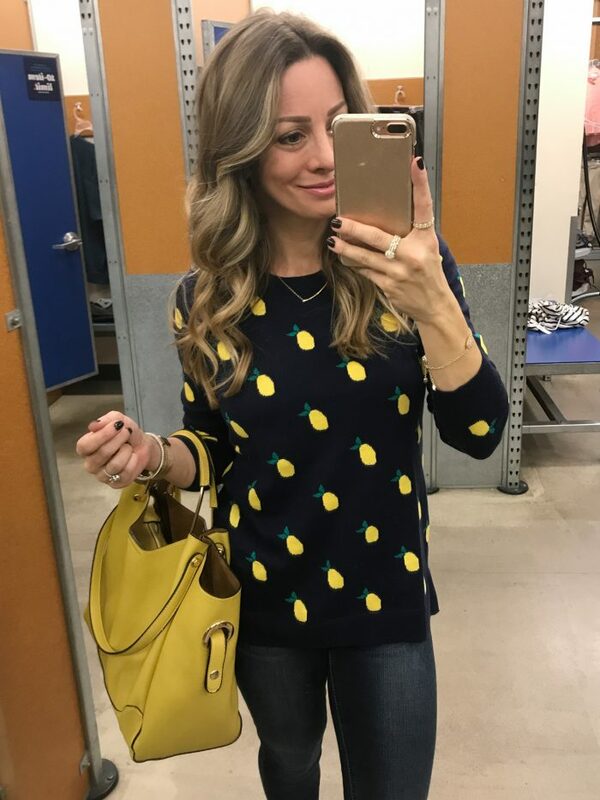 How fun is this lemon sweater?! I had to show you how especially great it looked with the yellow bag! This kind of lightweight sweater was always a go to for work because they are comfortable on your skin and keep you from freezing in a cold office. To up the visual interest and pretty factor, wear a collared shirt underneath. A striped one would be a wonderful mix of patterns with the lemons! Doesn’t eyelet feel so fresh for Spring?! I loved the top, but on me, the sleeves were overwhelming (even if it doesn’t look like that in the pic!) Other than that, it’s super cute, especially the zigzag hem at the bottom. Style Tip: I was just wearing a regular bra with it and you really couldn’t tell, but some skin peeks through the eyelet. That doesn’t bother me, but you might feel more comfortable with a tank or cami underneath. 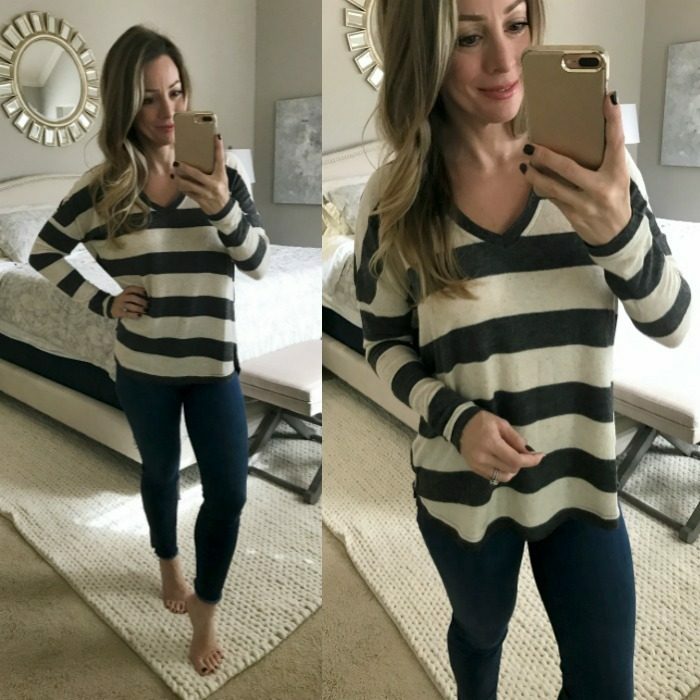 Love, Love, Love the fit and style of this lightweight sweater, but not going to lie, it’s not quite as “COZY” on the inside as I had hoped. Maybe I’m getting spoiled by all the super soft and cozy tops I’ve found this winter! #texturejunkie! As soon as I saw this I thought “date night material” and I was right! I love the plunging neckline for a bit of sassiness! The flattering style really emphasizes the smallest part of your body! It fits true to size and the hi/low hem hits just below your booty, in a good way 😉 #bonus. I didn’t know if I’d be able to recommend this top because it seemed really sheer when I pulled it out of the box. When I put it on, though, I was pleasantly surprised at how pretty and NOT see-through it is! It’s super thin and lightweight – almost like a t-shirt, but with a metallic sheen. The unique double hem really gets me too. And last but certainly not least, let’s hear it for pajamas! I swear my PJ collection is quickly growing to rival my fitness-wear collection… and I’m not mad about it!! These little shorts are so darling with the cutest little ruffle on the hem. Y’all know I love a great pair of pajamas and aren’t these seriously the cutest?! They had me at “Pink with black and white hearts” but the ruffles on the shorts put it over the edge. They run true to size, but if you like a more relaxed fit, size up! NORDSTROM • Check out the NEW markdowns here! 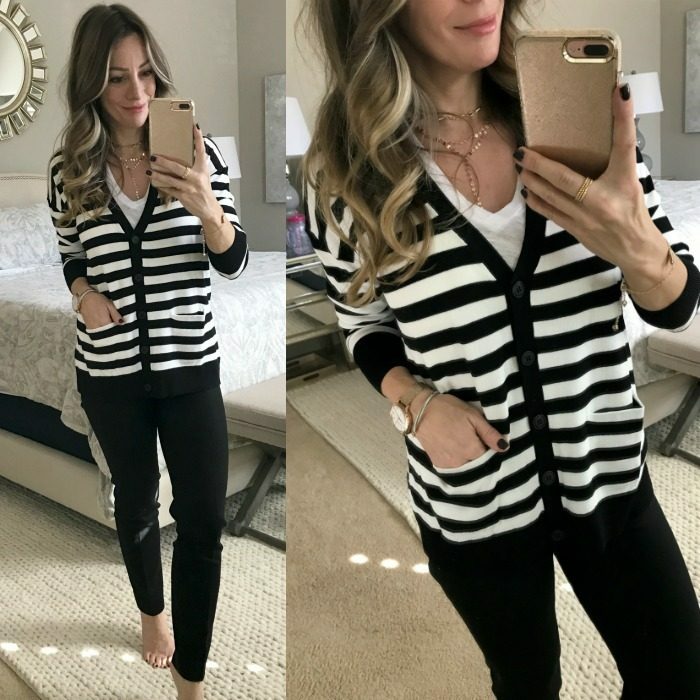 I’ve got this pullover in my cart right now and I love the fun take on a traditional blazer here– 25% off! LOFT • $50 off your $100 purchase. I adore this sunshiney pleat cuff blouse and this floral dress! Did you see they’re coming out with PLUS sizes?! ANTHROPOLOGIE • This fleece pullover has the cutest ruffle detail!! EXPRESS • Take an additional 50% Off Clearance! This bright colorblock sweater is calling my name! GAP • 40% off your purchase! I find the cutest things for Jordan there- go for the sales since they outgrow things so quickly! JCREW • 25% off full-price styles! 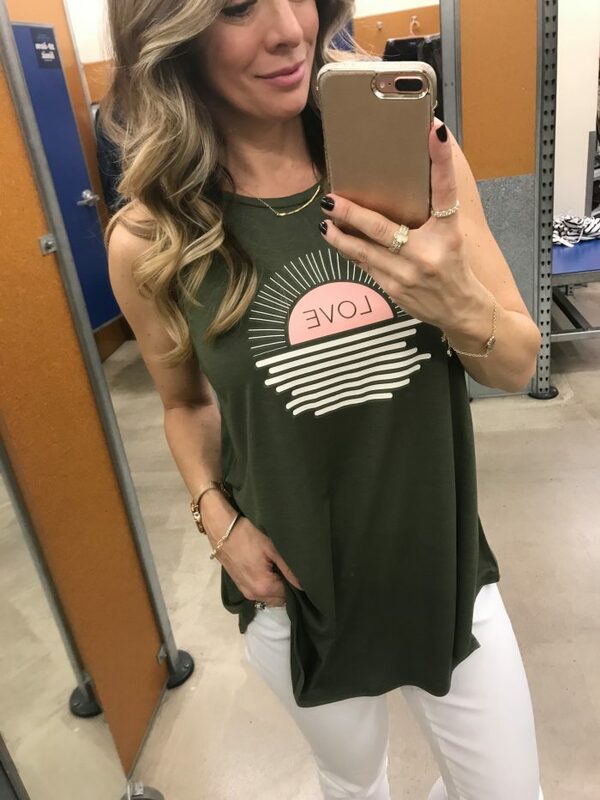 I want this LOVE FIRST tee! Super cute! OLD NAVY • 40% off jeans, fleece and outerwear! 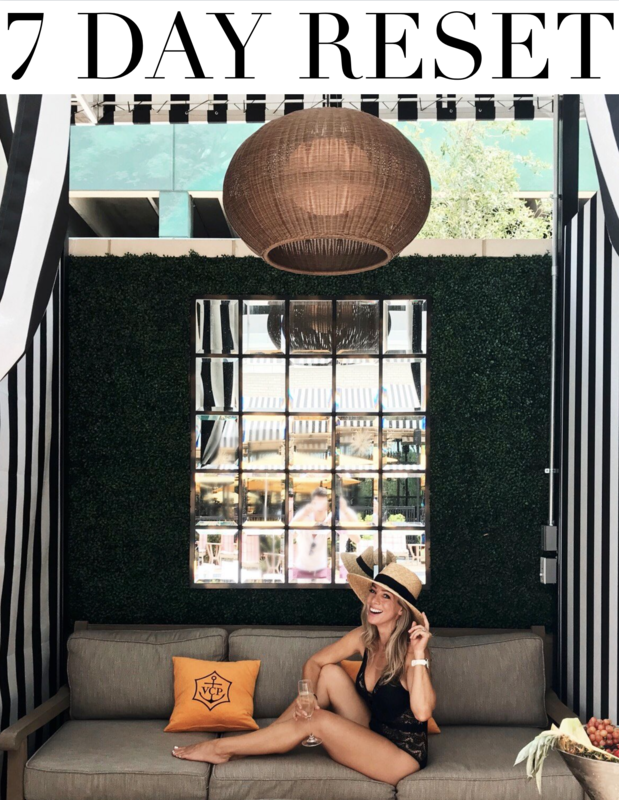 COLLEEN ROTHSCHILD BEAUTY • If you’re interested in taking better care of your skin this year, (I wish I started before I turned 40!) 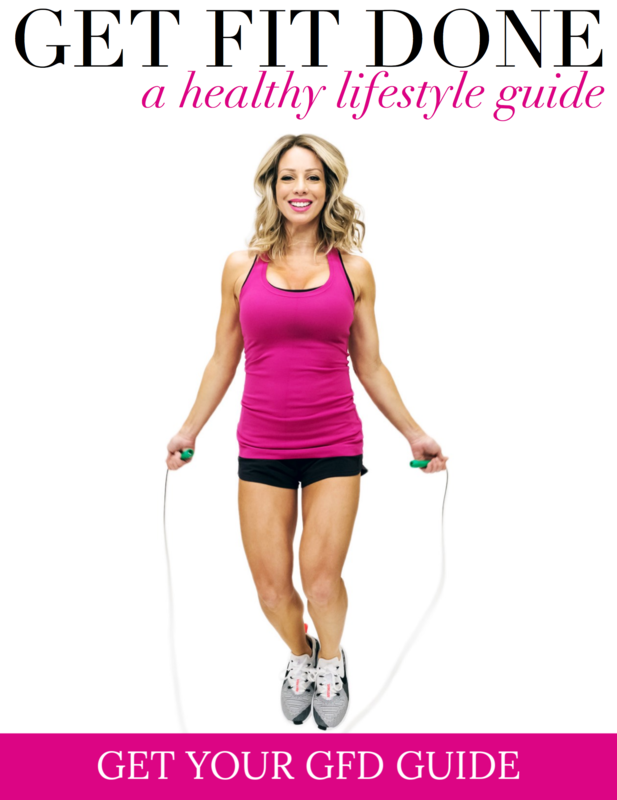 Colleen Rothschild is offering 20% off your first order! I’ve been using the Age Renewal Super Serum , Complete Eye Cream , Vitamin C Treatment Complex and also swear by the Clarifying Detox Mask and Face Oil No. 9. Have a great weekend friends! See you back here next week!! That wrap top looks precious on you!! And I’m loving striped shirt number 6 🙂 Can’t wait to start wearing spring clothes! So many striped tops! I have a striped shirt addiction! Always love your dressing room posts! I could not get the link for the white v-neck tank to work, though. Thanks Sandy! It’s fixed now! Ooooh my such cute stuff!!!! You look so cute in everything!!! Love!! Megan, I just love all your posts! I am so glad you threw some cute spring dresses into this one, as I am on the hunt! My brother is getting married and I need something for the rehearsal dinner still 🙂 Do you have a proper link for the black with large floral print? It’s not linking properly. Thanks so much!